My daughter, Andie, recently went vegan. I am beyond proud and SO happy. I don’t even know what else to say. I’m surprised and delighted that my low key vegan preachyness (is that a word?) got through to someone. Honestly, most of the time I feel like a caricature of myself while explaining why I went vegan. The reason is so multifaceted. But if I had to simplify my explanation it would be that I’m doing it for the animals. They’re so important, loving, smart, vulnerable, and exploited. Have you seen Earthlings? No? Well. Do it. Literally the STRONGEST person in the world is VEGAN. I’m not making that up. So if you claim to be a weight lifter and think you can’t be strong without flesh, eggs, and dairy products, you’re wrong. Simple as that. I’m honestly surprised that I didn’t say something sooner. If a vegan lifestyle is good enough for the strongest man in the WORLD… well, it is certainly good enough for your suburban lifestyle. 😉 Aw. Sorry. Where were we? On to the recipe. This is Andie’s creation. She rocks! Saute onion, peppers, and mushrooms in hot oil until tender. Add lime juice, coconut milk, peanut butter, tomatoes, beans, ginger, soy sauce, garlic, cilantro, vegetable broth, brown sugar, crushed red pepper, salt, and cayenne. Stir well. 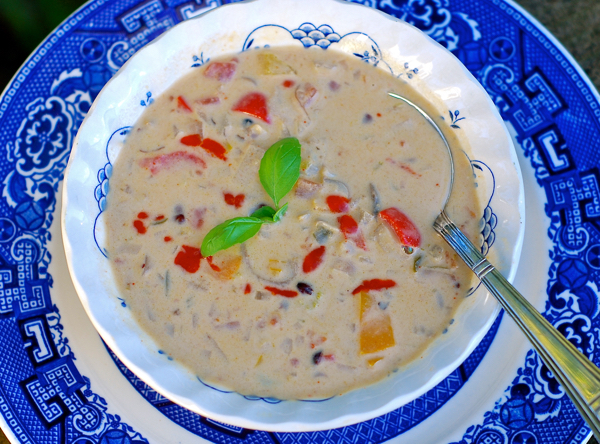 Turn heat to a low simmer and allow soup to cook for at least 30 minutes prior to serving. Garnish with more fresh cilantro and lime wedges, if you wish. I like to add a drizzle of Sriracha too.